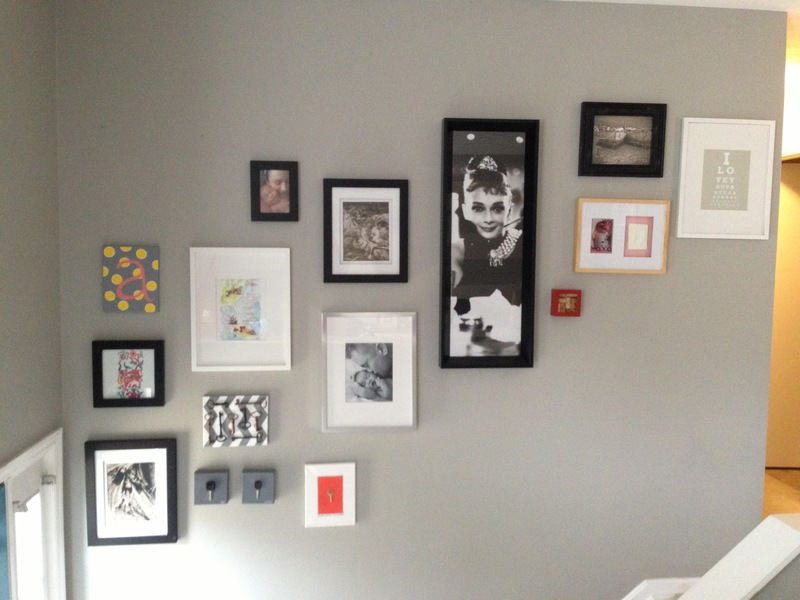 As promised, a gallery wall breakdown. What we chose, how we chose, how we (mostly I) made it. I love love love gallery walls. In fact, this isn’t our first gallery wall. Its at least the third. And third time is a charm my friends. 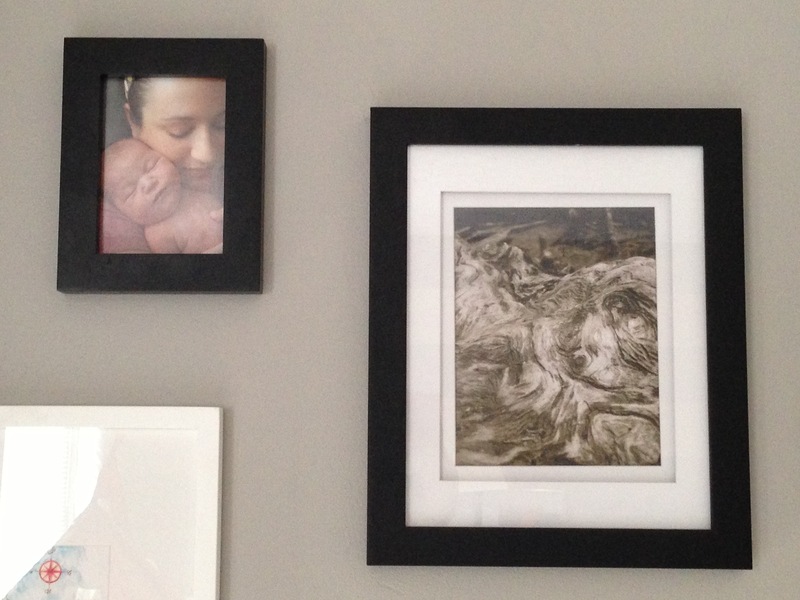 But it IS the first gallery wall (and probably only one for a while) in our own grown-up house. I’ll do my best to go left to right with some up and down in between… don’t get dizzy now! 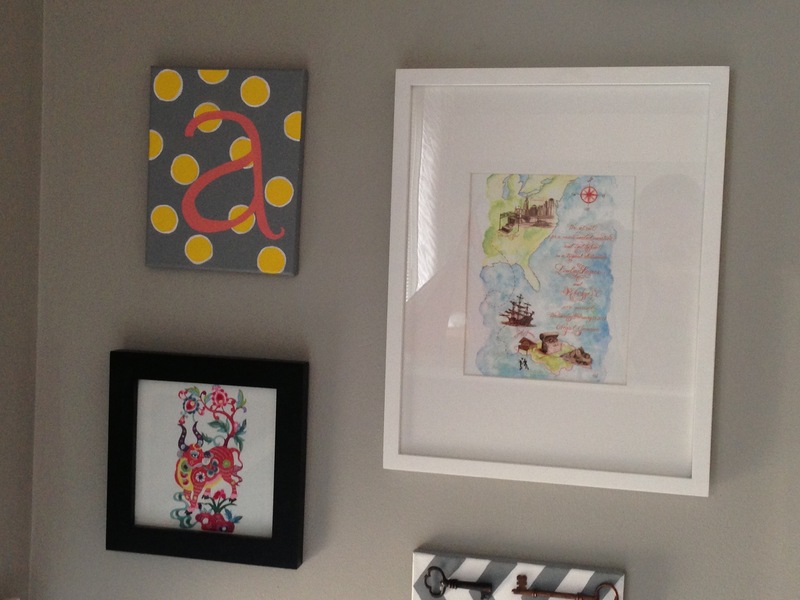 The top left item is a small canvas I painted ages ago when I was dreaming of filling O’s wall with the alphabet. The idea for her room evolved (I guess I should post about her adorable room one day?) so I was left with a bunch of canvases of letters. I painted over most of them but I saved the A (for our last name) and waited for the right spot to hang it. Below that is a Chinese paper art cut-out of an ox. I received a book full of paper art and cut outs from one of my father’s Chinese business associates. I framed this one because it had a great composition and the most bold colors of them all. It once lived on our hallway wall in our first apartment but it fits right in here. The largest piece is a large print of our wedding announcement. We eloped in secret to Jamaica and had my mom send these out from “Loveland, Ohio” on the day we wed. Our good friend Erica made it. 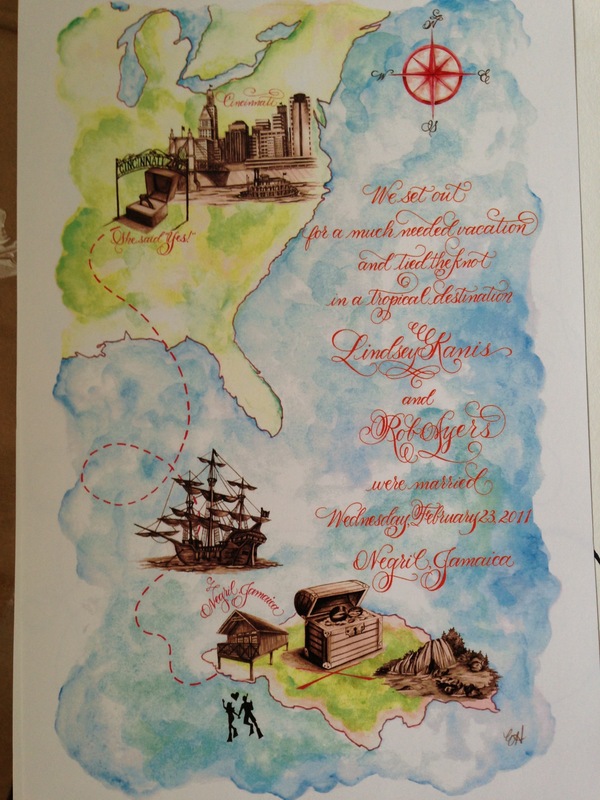 The entire thing is a water color treasure map depicting our engagement at the Cincinnati Zoo and our surprise Jamaican wedding. There is even a pirate ship and a treasure chest with our wedding rings. I think Erica and I came up with the rhyme together and she did all of that calligraphy by hand. Gorgeous work and one of my most prized possessions. Here is a closer look at it. Seriously one of my favorite things in the world. Closest to the door is a print of a photo I took of driftwood on one of our trips to the lake ages ago. The frame had a traumatic move but I plan on patching it with wood filler and giving it a fresh coat of paint. You can also see a little more of the Chinese ox in this picture. One of my favorite DIY wall art techniques is to take simple items and display them in an interesting way. Here I have done that with keys. I collect keys. I don’t know why but I have a shoe box full of them. So last time we did a gallery wall at our old place I grabbed our old car keys… Hubby had his beloved Volvo and I had my dream car Wanda the Wrangler. (Yes, I name my cars. My current ride is a 2012 charcoal Honda Pilot. She’s dark and boxy and looks like a Rhino so I named her Rhina). Enough about keys… The point is that all I did was paint a small canvas and hot glued my keys on. Then we each signed out names. 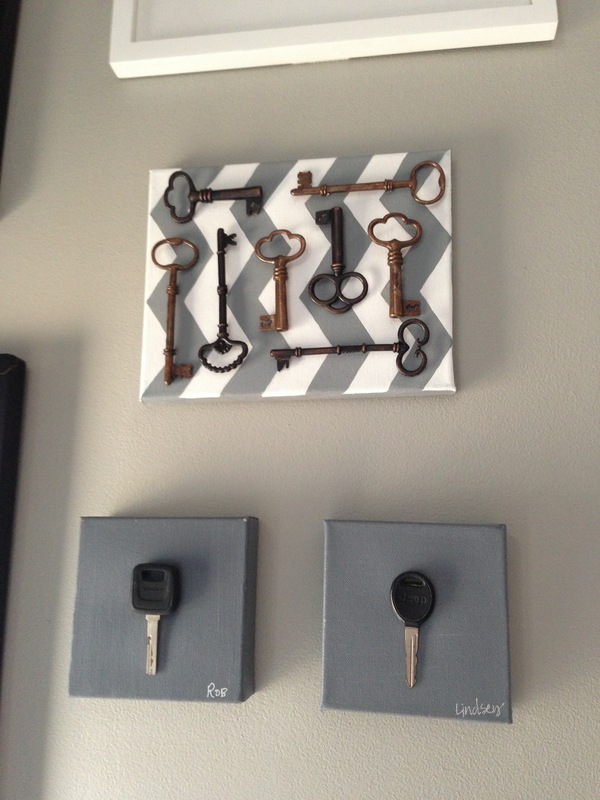 The keys above are also on a canvas that I painted a coordinated chevron pattern on and glued some replica skeleton keys to it. 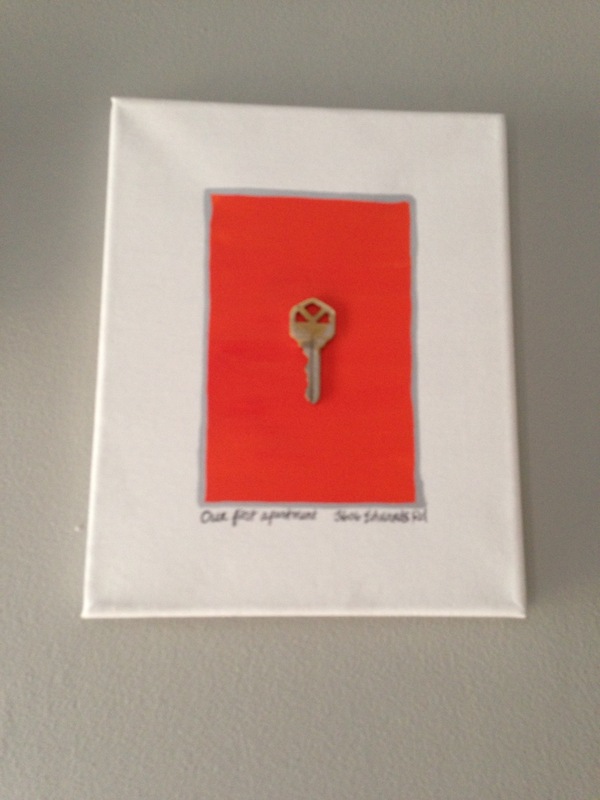 This is our old apartment key and you guessed it- I painted a canvas and glued on a key. Then I used a sharpie to label it “Our First Apartment” and the address. 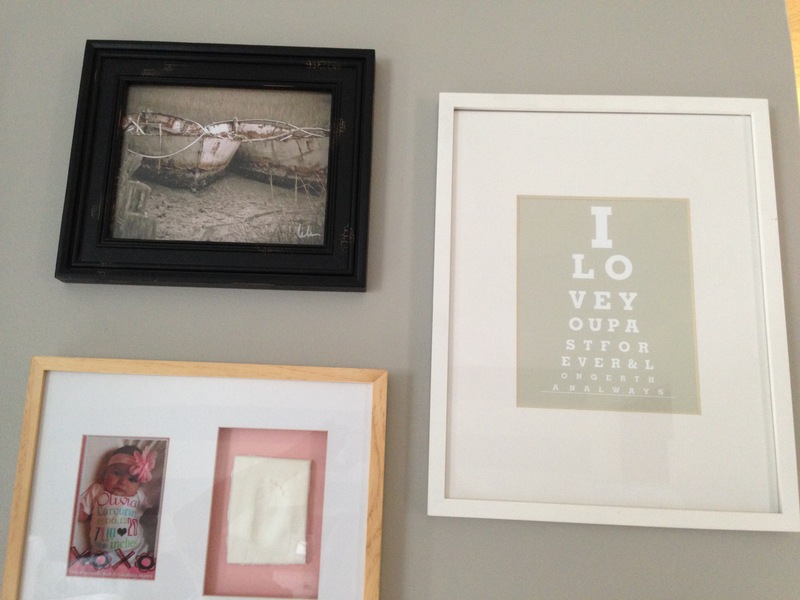 I like it because it is sentimental and it ties in with a few other items on the wall. I chose orange to add a little color and pick up some of the vibrant colors from the Chinese ox. 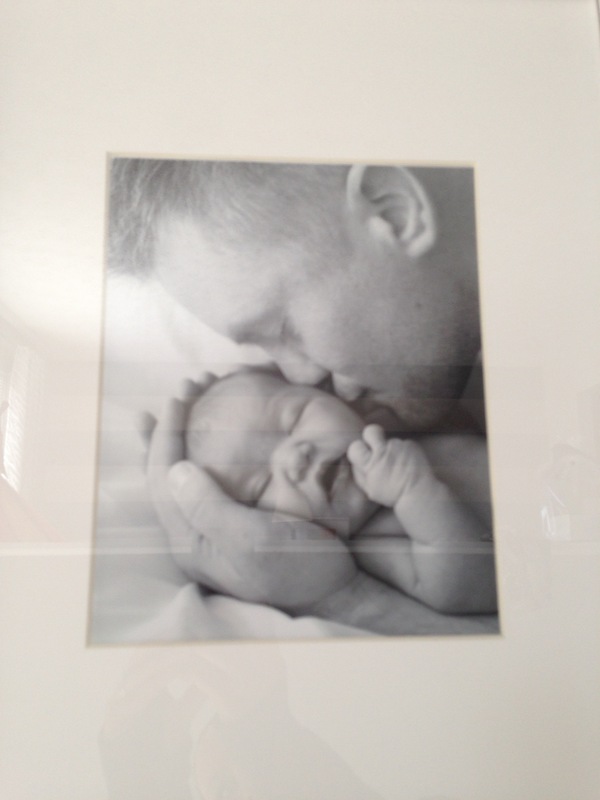 The next picture is of Hubby kissing O when she was just a day old. I especially love it in black and white with the silver frame. It is a daily reminder for me of why I’m here doing what I’m doing each day. Above that is a smaller picture of me with O on the same day. I can’t believe she was ever so small. And next to that is another driftwood picture that I took at the lake. Hubby and I used to stare at this picture and talk about what we see. I see an old man’s face. What do you see? 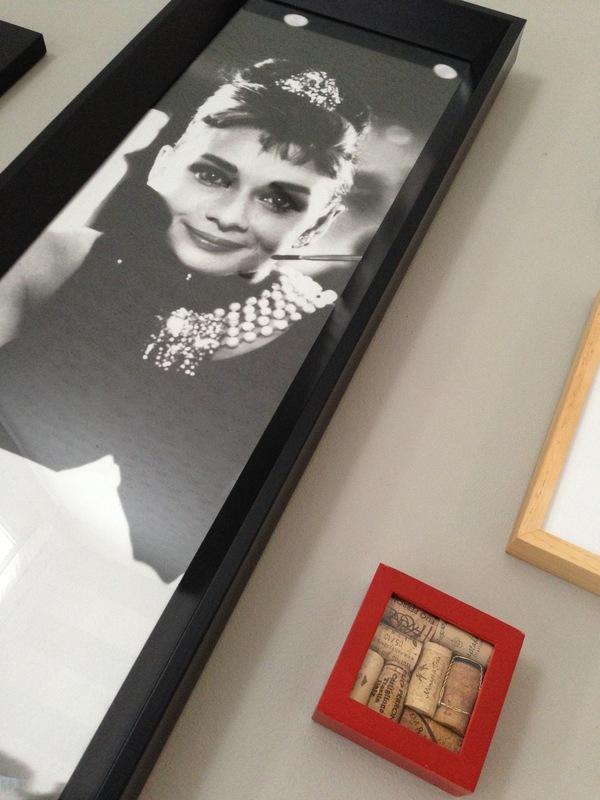 Ah, and then there is a giant print of Audrey Hepburn as Holly Golightly. Hubby and I have agreed that she is only a placeholder for something else… should we ever find anything more fantastic than her. The red frame holds corks. 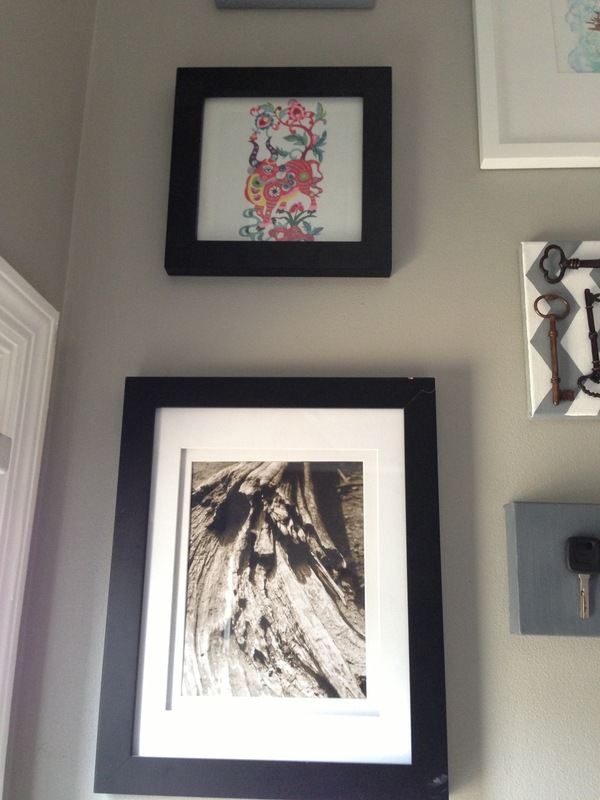 Its another free art piece I made with an everyday item for our old gallery wall. I even left the wire cage on the champagne cork in true Hilda style. Can you tell I like wine and corks? Because I posted about them here, here and here. Next is a framed sepia row boat print purchased from The Market in Charleston. And then there is an adorable little Baby O foot print in plaster and a copy of her Valentine’s Day themed birth announcement. The natural wood frame is nice but the rest of the frames on the wall are black, white or silver so I think it may eventually get painted to give it more cohesion with the rest of the wall. The last piece is a typography print of an eye exam chart but it says “I love you past forever and longer than always” instead of the alphabet. I bought it on Etsy as a valentines day gift for Hubby years ago. I wish I could remember which shop it came from. So I that’s the novel version of our gallery wall. It is actually the second time I’ve written it… apparently WordPress ate my last post so I did this all over again. That’s love people. I love you! I didn’t mean for it to be so long but each piece has a story. The stories are what is starting to make our house a home. What makes your home?